Being a human is the hardest thing any of us will ever have to do. Even when you try your best at all times, you tend to generally fail at most things you set out to accomplish. Become a person of conformity by shedding or concealing all of your unique and pointy parts, and you will get along in life just fine, but you will feel like a tool and never find the true fulfillment life can bestow, and eventually become dead inside. Keep all of your pointy edges exposed, and you’re bound to spend your life running into trouble and being misunderstood, invariably beset by conflict at every turn. Find a place somewhere in the middle and you end up with the worst pronouncement of all: average. Music can be both a portal of escapism for the conformed, and a type of therapy for the ill-adjusted. People listen and play music to fit in, or to stand out. No matter the application, all people use music to help cope with being human. Some music helps more than other music with coping with the human condition. The Wild Reeds fit into that category, even if they don’t fit anywhere else. From Los Angeles, California, The Wild Reeds have gone from open mic friends to one of the hottest emerging names in American roots and rock. A well-received visit to NPR’s Tiny Desk Concert a couple of years ago, and scores of stellar performances around the country have landed this female singing trio a contract with Dualtone, and now a new album called The World We Built that looks to become their breakout. Their 2014 debut record Blind and Brave was much more rootsy than this one, but you almost knew immediately when witnessing this band they would eventually take a more electric turn. That just seems to be the way of things with bands like this. Though electric guitar was often featured in their sets, so was an organic, acoustical approach, including the signature, ceremonial fourth member of The Wild Reeds—a compact pump organ with “The Wild Reeds” plastered on the side. Now that’s been replaced by an electric keyboard, which is fine because you could never hear the pump organ anyway. Instrumentation aside, whether in the earliest incarnations of the band or its more electrified current state, it’s the three-part harmonies that set the cornerstone of their sound, and make them more tied to the Carter Family than anything the current indie rock world can offer as comps. The truth is The Wild Reeds don’t fit anywhere—country, roots, or rock. That’s one of the reasons you know they’re good, and one of the reasons they’re extended the creative latitude to explore the farthest reaches of the frayed ends of the human emotional map with boldness, both sonically and lyrically. Never has confusion and indecision been graced with such articulate, yet poetic explanation, and accompanied by such melodic aptitude. The Wild Reeds are a collection of ill-fitting parts that happen to fit perfectly together. They don’t fit together well because of their lack of flaws, but because of them. They each fill in right where the next one fails until they make for a smooth, shiny, dazzling object, devoid of flaws from a surface inspection. Yet it’s the imperfections in the interior that give rise to the inspiration to their music. The Wild Reeds and The World We Built is wide, sweeping, bold, expansive, and exploritative in the way they skip right over the same old verse/chorus 1-4-5 structures, and would rather craft these quiet moments leading into soaring crescendos that do more justice to the emotional roller coaster present in the lyrics, and in life. Though The Wild Reeds are comprised of three primary songwriters, it’s challenging to pick out the individual composers of each song in the way their styles meld just as well as their singing voices. Sometimes screechy in a fetching way, and in other times frail and quiet, if nothing else, it’s hard to remain unopinionated about this music. 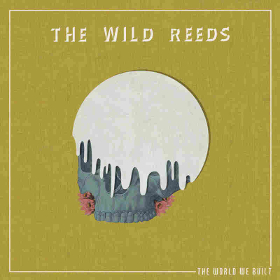 The Wild Reeds are so confident the opening track “Only Songs” is good enough for a wide ear that they even made a radio edit for it, and they’re right about how the song encompasses all their greatest attributes the best. But the themes and truths explored in the final, 7-minute song “Fruition” is something that may ultimately be regarded as their opus. In between these songs, sometimes the production of The World We Built feels a bit suffocating, or stretching for creative expression as opposed to adhering to the heart of the song. One of the great things about The Wild Reeds is they don’t need layers of polish to shine. They just need their harmonies and a mic to pick them up, and any blemishes come across as endearing. Many in the country, and even the Americana realm may scoff at The Wild Reeds as balderdash, and fitting for the same label as The Lumineers and that hipster Shakey Graves. This is not the right fare for the Johnny Whitesides of roots music, and that’s fine. But for those humans who struggle with the world, their place in it, and how to interface with others, the music of The Wild Reeds will be like a welcome balm on an irritable disposition, with the power not just to alleviate the discomfort, but to heal the underlying battle wounds one invariably gets simply by being human. 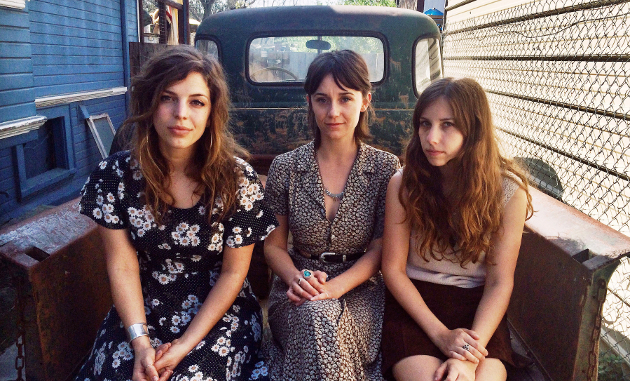 The Wild Reeds are Kinsey Lee, Sharon Silva and Mackenzie Howe. Nick Jones and Nick Phakpiseth are the rhythm section. Is this song representative for the rest of the album? I would say so, but that’s kind of a hard question to answer. There is tons of media out there on The Wild Reeds, videos and such for folks who may be sitting on the fence or something. I’d suggest everyone check out their Tiny Desk Concert that I linked to above. That’s where they really took off. If you see The Wild Reeds live, you’re immediately sold, even if it’s not your kind of music. But at least The Secret Sisters seems to stay acoustic. We are just finishing spring break. Drove to and from our destination for about 18 hours. For the first half I subjected my wife and daughter to my country and Americana music. On the way home I compromised and let them listen to the radio and some of “their” pop music. I would have been quite alright had The Wild Reeds been on the radio compared to much of what I’d heard. Definitely would not have felt the urge to blow up my radio. I would be completely fine if my daughter was to listen to this type of “organic” pop music. Talented band with great singing and actual instruments. I find a lot to like in this album. It’s a pity that the in-your-face electric arrangements spoil it somewhat for me. I absolutely loved “Only Songs” as soon as I heard it and really like some of the other albums tracks from the Dualtone website. I’m glad I heard those first. I prefer the electric guitar/more produced sound. If I had heard the tiny desk concert first, I wouldn’t have paid them anymore attention. my list of albums/acts to check out is getting dauntingly long. “their styles meld just as well as their singing voices”. There’s a trace of Beach Boys sound in there, along with everything else. catchy tune too. and it actually has dynamics…. So much good music going on. Checked it out.. Sounds kinda cool. Also notice they were comin to town in May.. I think a show is $14..
while we are talking new music, Sam Outlaw new album ”Tenderheart” is ridiculously good…my best debut country album this year so far.. I saw them last year at Bristol Rhythm and Roots. As you said, they aren’t country. I enjoyed them. I’ll have to check this out.